XBrick.io has been developed independently by its technical team who have extensive experience in crypto currency and blockchain technologies. XBrick offers multiple languages to users from all around the world, supports an automatic KYC identity verification procedure, adopts the bank-standard SSL encrypted data transfer and multi-clustered system architecture, and applies the cold storage system for crypto wallet management. The high-performance trading engine of XBrick is capable of processing more than 2 million orders per second. XBrick aims to provide secure, stable and convenient global crypto currency exchange services. System 1.0 has been operating since 11 November 2017. Sytem 2.0 is due to hit the market with our own R&Ded Global Consolidated Order Book provided by a Dynamic Liquidity Providing Engine. We're to bring the world to us. As different problems hit exchanges and users suffered serious financial losses, the growing regulatory and security concerns have become increasingly mainstream. Finally, last September, there came a time when we asked ourselves, “if not now, when? If not us, who?” Seven months later, today, we are ready to build on top of XBrick.io, the next generation crypto-to-crypto-only exchange, and launch our own platform and utility token, XBC. Coming from traditional global financial and investment banking backgrounds, platform security is in our DNA. XBrick adopts the bank-standard SSL encrypted data transfer and multi-clustered system architecture, and applies the cold storage system for crypto wallet management. We believe exchanges have the full responsibility of creating a safe trading environment for its users, and are fully committed to prioritizing security over all other business factors. There is no tradeoff when it comes to safeguarding our users’ crypto assets. Our proprietary technologies run by close to 50 developers are solving common liquidity issues from the root. On XBrick, a sophisticated technology continuously scans and gathers tradable liquidity from channels of the world. Through our platform, users have the access to the global cryptocurrency market and are able to trade at the best buy and sell crypto prices. Our strategic partner LiquidAlpha has been developing the liquidity engine, namely Dynamic Liquidity Providing Engine (DLPE) independently. The system is configured to trade against client orders in circumstances of zero liquidity and has a sophisticated algorithm to execute orders under certain conditions every few seconds. Watch the video to discover how DLPE can bring Wall Street-level automated trading to our users. Speed is everything in crypto trading. XBrick is capable of processing more than 2 million orders per second. This gives us enormous growth capacity as we scale. Our KYC system is automated and connected to global real name databases that allow you to use your local ID documents and run real-time verification online. The entire registration and verification process takes only about 5 minutes. When you are with us, you can fully concentrate on crypto trading while we take care of everything involved in the process. XBrick is the very first exchange worldwide to denominate Bitcoin in thousand parts: mBTC. mBTC is BTC divide by 1000, not a new crypto currency. In XBrick, the deposit and withdrawal of mBTC use the normal BTC addresses, giving our users flexibility to experience the new unit of BTC. XBrick pre-screens token sale projects and works with less than 3% of projects applied for distribution. We do not only look at potential exponential growth factors, but also team integrity, project sustainability and legal factors. We’re also building up this community as in the future, you will select and debate on which projects we bring on and our job is to CHECK on them for you. 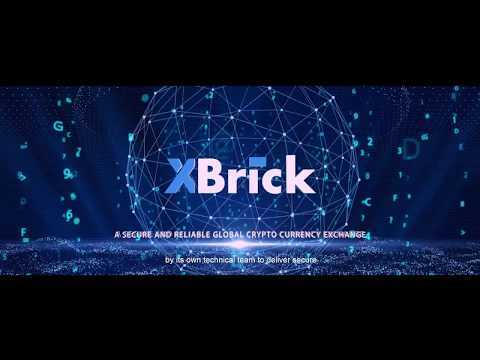 XBrick.io is a global crypto currency exchange owned by X Blockchain Pty Ltd, a blockchain technology company headquartered in Sydney, Australia. XBrick is advised by very reputable internationally know law firms within Australia. The core members of XBrick have previously held senior positions at various ASX listed entities, Australian boutique family offices, Goldman Sachs and other reputable organisations. The operating team have strong corporate management skills honed in global investment banking, quantitative trading and risk management. If you also agree the above competitive edges could set new standards to crypto exchanges and to provide a more safe, efficient and liquid trading platform to users, we invite you to learn more about us, interact with our community, and become part of us in the history-making journey in cryptocurrency exchange.